The latest available data from the federal courts show that during January 2018 the government reported 172 new environmental civil lawsuits filed. This is the third month in a row in which an unusually large number of new environmental matters were filed, bringing the latest quarter to a total of 745 new cases. According to the case-by-case information analyzed by the Transactional Records Access Clearinghouse (TRAC), this number is up 276 percent over the previous quarter when the number of civil filings of this type totaled 198. The comparisons of the number of civil filings for environmental-related suits are based on case-by-case court records which were compiled and analyzed by TRAC (see Table 1). Any number of a range of different statutes may form the cause of action in this litigation. For some, the United States is directly involved. The federal government was sued in FY 2018, for example, in cases involving such matters as the review of agency action under Title 42 Section 4321 and Title 30 Section 181, alleged violations of the Administrative Procedures Act (5 USC 702), emission standards under the Clean Air Act (42 USC 7604), the Clean Water Act (33 USC 1319) or the Endangered Species Act (16 USC 1538 or 1540). Examples of affirmative cases brought by the federal government involved disputes under Title 42 Section 6901 related to environmental cleanup expenses, the Clean Air Act (42 USC 7413), and the Oil Pollution Act of 1990 (33 USC 2701). 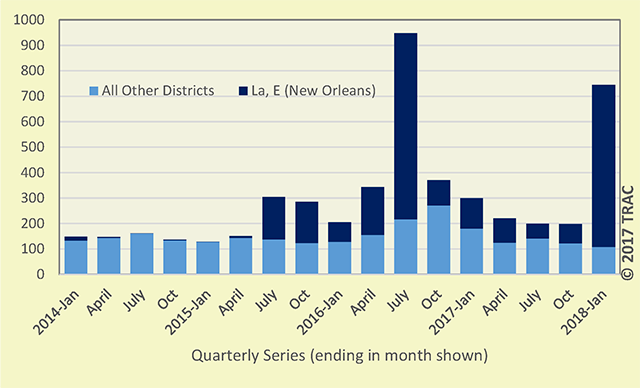 However, the jump in lawsuits during the last quarter was driven by litigation in the Eastern District of Louisiana (New Orleans) involving various claimants and BP Exploration & Production, Inc. These suits were part of the multi-district litigation that was assigned to U.S. District Judge Carl J. Barbier in the aftermath of the Deepwater Horizon oil spill. Here the cause of action arose largely under the Oil Pollution Act, Title 33 Section 2701. The quarterly trends in environmental litigation are shown more clearly in Figure 1. The cases that were filed in the Eastern District of Louisiana are distinguished by a darker shade. This clearly shows that the jump this past quarter was due to the unusually large number of filings in that district. Similarly, the sharp jump shown in the quarter ending July 2016 also reflects litigation activity in that court arising out of the Deepwater Horizon oil spill. Indeed, almost half (48.8%) of all litigation that arose since January 2014 was in this single district. Civil environmental litigation in the remaining 93 federal judicial districts shows no recent upward trend. In fact, for the rest of the country the quarter ending October 2016 showed the highest level of new environmental suits and new civil litigation has generally fallen since then.